Brick and frame home built by Archibald Muir in 1856 at the corner of Kingston and Bellamy Roads. The home was demolished in the 1960's. Mary Aitken Muir, Alexander Neilson Muir, David Fleetwood Young, Janet McLellan Muir, Edith Florence Chester Muir, Archibald McLellan Muir. Three of the four Muir table leaves. 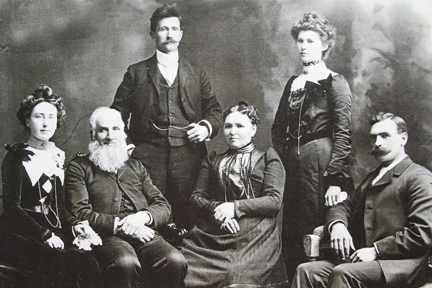 The Muir family, lead by Archibald Muir, came from Strathaven, Lanarkshire, Scotland and can be traced back to our sixteenth century ancestors. John Muir (I) was our first recorded ancestor and he was born in Scotland and farmed Plewland and died in May of 1596. Archibald Muir of Scarborough was the first decendent of John Muir to immigrate to the new world. While still living in Scotland, he farmed on Laigh Plewland which was a farm in Glengavel, twelve kilometres southwest of Strathaven. 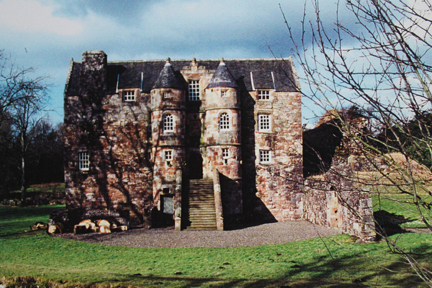 This was eighty kilometers east of Rowallan Castle which was included in the original Muir estate and was an excellent example of the Scottish vertical tower-house style of architecture which developed from the old Norman keeps. 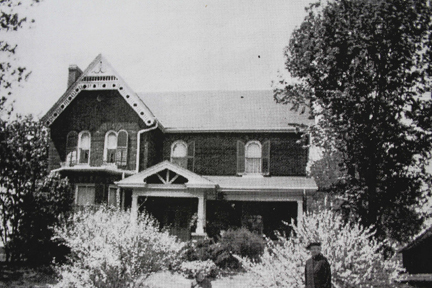 At the age of sixty-five Archibald built a new two storey home just west of Markham Road on the north west corner of Bellamy and Kingston Roads. This new house had a brick first storey and a framed, clapboard second storey. Later this house would form the north east wing of the more substantial brick home which would be completed by his son Alexander (II) shortly after Archibald's death in 1881. Following Archibald's death another larger barn was also built to the north of the new brick home along with a drive shed and a chicken coop. The oak table to which the table leaves belonged was brought to this beautiful new farmhouse from the older frame cottage. It was lovingly placed in the large, farm kitchen where it was in daily use by the family, as well as the hired farm hands who would come in for lunch and an opportunity to rest. The Muir family dined in this room daily and the oak table was a cherished possession of the time, which was passed down through the years from one generation to the next, ultimately finding its final place with me. Over dinner and lunches, many of the issues of the day were discussed. Upon this table dinners were served, Christmases, Easters, and birthdays were all celebrated, babies were delivered, and Christened upon this historic piece of furniture. The original Muir farm in Scarborough was a dairy farm with Holstein cattle . Hay was also grown and the early farm work was done almost exclusively by Clydesdale horses. The Clydesdale takes its name from Clydesdale, the old name for Lanarkshire, Scotland noted for the River Clyde. Large numbers of Clydesdales were imported from Scotland in the late 19th. and early 20th. centuries. During my childhood I learned to associate this table with the activities of my immediate and extended family, and upon my marriage, the table was passed from my mother Mary Ellen (Muir) Cameron to me. Unfortunately, though, throughout the years, and during a number of moves this valuable antique table sadly became damaged, and pieces were lost in transit, until such time as there was nothing remaining but the leaves and one damaged end. The leaves of the table, which had formerly been used to extend the table, and the family hospitality to friends, neighbours, as well as hired hands, is all that remains. I was going to make chargers from these leaves. On measuring for the best yield I found that I was going to come up a bit short for chargers but could get a nice bowl out of each leaf. The leaves are 3/4" thick and to make chargers I require wood that is, at the very minimum, 7/8" thick. This means that in order to get a good thickness for chargers I have to rip the leaves into strips and laminate them face to face. Knowing what the yield will be I cut the leaf into 3 pieces which makes it easier to manage and I can get more accurate cuts. 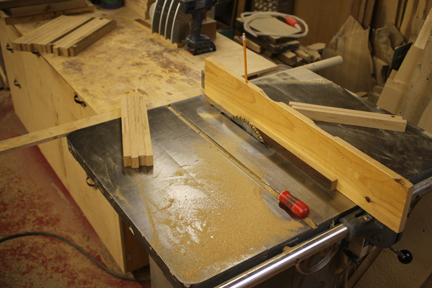 I use the table saw to both joint the wood and to remove the finished surface. Although it would definitely be fun to be able to leave the original surface on, the finish and grime on these surfaces would prevent the glue from creating a proper bond. Here I show the wood laminated into a square that is roughly 13 1/2" to a side and 1 1/4" thick. 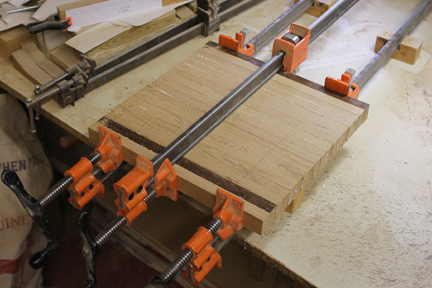 All but one of the joints are laminated. This creates two laminated boards. 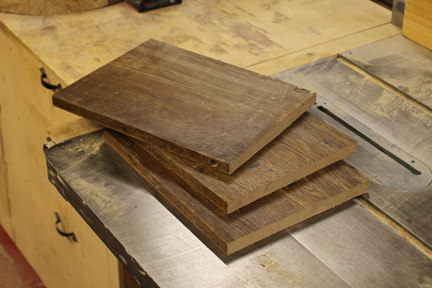 When dry, these boards are milled to get uniform surfaces. They are then temporarily clamped together so that the rings can be drawn on them. 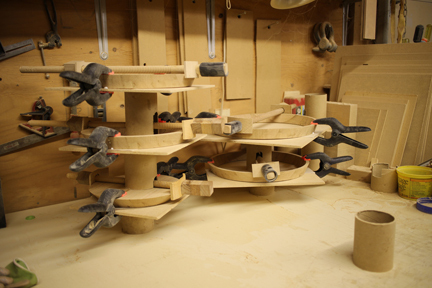 They are separated and the half rings are cut out on the bandsaw. The half rings have been cut and and glued together. From here the rings will be cleaned up, sanded to make sure they are flat and the chuck hole for mounting the piece on the lathe will be turned. The rings will be added one at a time and each will be trued before the next one is added. When this process is complete the bowl blank will be ready for turning and sanding. 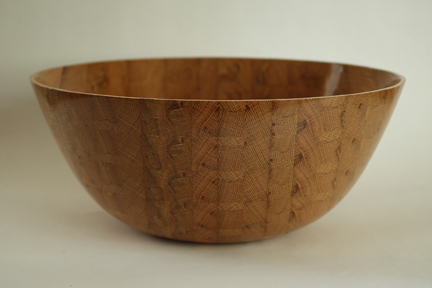 Generally speaking, oak does not make a good salad bowl because it is so porous. The wood in these table leaves is very tight grained. With the aid of the finish and some of the very fine sanding dust, the piece has been sealed enough to use it for salad. This bowl was a pleasure to make, sand and finish. Given its story, the type of furniture it was from and the joy in making it, I called it "Family Center". If you can make it to the show, please look closely at this piece. You will see where the original craftsman carefully laminated the oak to create leaves of the highest quality. There is no doubt that the table was well-made. This bowl is for sale. If you are interested, please go to the price page for more information.